When I think about the last couple weeks, this quote from Woody Allen springs immediately to mind. 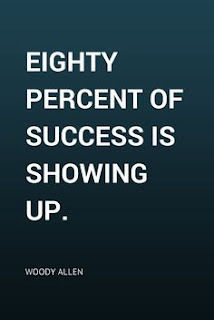 "Eighty percent of success is showing up." Showing up should be easy - I mean, it's just beginning, being present, giving something a try. Showing up isn't finishing something, being perfect at something, working yourself into a frenzy over something. But showing up can be really difficult. Not showing up could mean just not putting in the time. Or not really giving the task at hand your full attention. Or letting negative emotions get in the way of starting in earnest. These past couple weeks, showing up - as in, making enough time - has been a challenge for me. Amidst lots of competing priorities, I have struggled to make enough space for daily Luganda study. It's a challenge I encounter daily - and usually manage to overcome - but it's a challenge nonetheless. But when I do begin, it feels good. I am making progress. It's slow and patchy, and filled with errors, but I am actually learning Luganda. Every time I get to work, I am almost surprised at what I am able to remember, and what I am able to do. Then, it's time for the other 20% that Woody Allen doesn't account for. The focus, the patience, the repetition, the disappointment when I forget something I thought I'd learned. But still, the 80% is there, as soon as I open my notebook. I have really learned to fully show up during my language sessions with my mentor. Those lessons are harder than just opening up a book and beginning because they're interactive. As an extremely extraverted feeler, it's difficult for me to face the knowledge that I may disappoint my mentor with my slow progress, or that I may annoy him with my awkward, slow pronunciation. I know he's a teacher and so those things should not bother him, but I can't help but feel anxious at my inability to do well for him. However, once I show up for my sessions, I force myself to laugh at myself, and I just try. And I probably sound like an idiot, but it's better than not sounding like anything! During these sessions, rife with mistakes and awkward pauses, I learn more than at any other time of the week. Because I show up - fully. In the past week I had two sessions with my mentor because of my schedule this week. I've now learned three past tenses and the present tense - but I really need to make time to practice, practice, practice them. That's what's on the agenda for the week ahead! I really enjoy your writing style in these blog posts, Lauren!